One of the guest was a diabetic and her son severely allergic to nuts so I needed to stick to something basic and I also forgot to grab vegetable oil at the market, was completely out of coconut oil, so I had to quickly search for a recipe that used shortening (Oh, I love baking with shortening, and usually go through three to four tubs of it easily at Christmastime!). Not many people choose to bake with shortening any more, but if you look at old recipes, especially those written during the Great Depression when butter was more than a luxury, but I always love how the texture of the baked goods turns out and I almost never get heartburn like I do when I eat cookies with butter. Must Have Mom had a great recipe for "Light and Fluffy Banana Bread" that I was able to adapt slightly to make the perfect bread for our guests. Cream together the shortening, sugar and bananas. Combine dry ingredients and gently stir them into shortening mixture alternately with liquid ingredients. Prepare your loaf pan (or mini loaf pans) with non-stick spray or shortening and then add your banana bread mixture. Bake at 350 degrees for 1 hour until a toothpick inserted in the center comes out clean. The recipe already uses little sugar in comparison to others, but I subtracted 1/4 cup from the recipe, added a teaspoon of cinnamon, 1/4 teaspoon of nutmeg (my absolute favorite spice when it comes to baking) and blended a little bit of mashed banana to the mix as well. 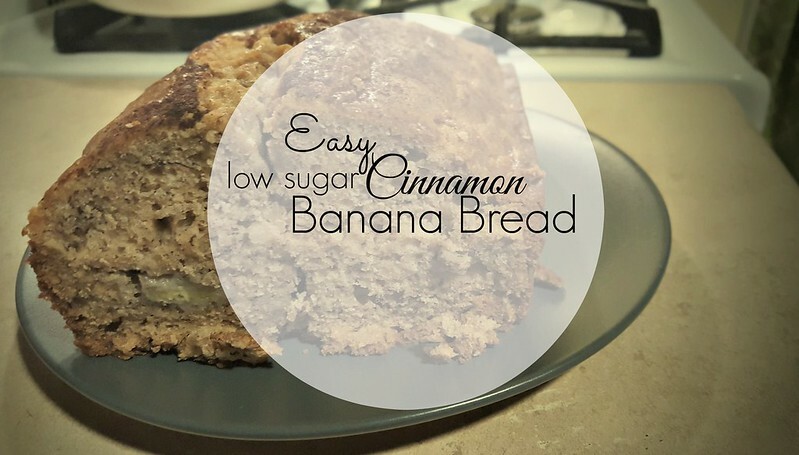 The added banana gave it a little more natural sweetness and was used since I had subtracted some of the sugar from the recipe. Before baking, I also sprinkled some cinnamon onto the top. The bread smelled so good throughout the house. There was definitely no twisting anyone's arm to have a slice (or two...or three). I even baked a second to share with the rest of the neighbors! It was super moist on the inside, golden on the outside, and had a great balance of flavor. in comparison to the recipe from Must Have Mom's blog my photos are definitely difference, but remember, I did change the recipe a bit. Now I just need more guests to giver her's a go!